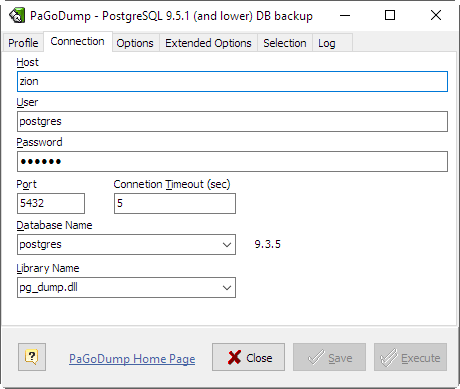 Microolap PaGoDump for PostgreSQL: GUI tool for extracting a PostgreSQL database into SQL script file, archived SQL file (GZIP), TAR archive, or pg_restore custom archive (*.backup). While running PaGoDump, one should examine the output for any warnings (Log tab), especially in light of the limitations listed below. It is portable, installation is not required. May be ran from any removable device. Full support of pg_dump options and output formats. Enter here existing profile file name to open previously saved options or new name to have Save functionality enabled. Double-click to open one of recently used profiles. Specifies the host name of the machine on which the server is running. Specifies a password for the connection. Specifies the TCP port on which the server is listening for connections. Defaults to the PGPORT environment variable, if set, or a compiled-in default. Specifies amount of time to attempt a connection in seconds. Specifies the name of the database to be dumped. If all options are correct then target server version string appears. Specifies the name of the dump library to be used. PLAIN - output a plain-text SQL script file (the default). TAR - output a tar archive suitable for input into pg_restore. Using this archive format allows reordering and/or exclusion of database objects at the time the database is restored. It is also possible to limit which data is reloaded at restore time. COMPRESS - output a custom archive suitable for input into pg_restore. This is the most flexible format in that it allows reordering of loading data as well as object definitions. This format is also compressed by default. DIRECTORY - Output a directory-format archive suitable for input into pg_restore. This will create a directory with one file for each table and blob being dumped, plus a so-called Table of Contents file describing the dumped objects in a machine-readable format that pg_restore can read. A directory format archive can be manipulated with standard OS tools; for example, files in an uncompressed archive can be compressed with the gzip tool. This format is compressed by default and also supports parallel dumps. Include large objects in the dump. This is the default behavior except when Schema Only is specified, so theis option is only useful to add large objects to selective dumps. Dump object identifiers OIDs as part of the data for every table. Use this option if your application references the OID columns in some way (e.g., in a foreign key constraint). Otherwise, this option should not be used. Applicable for pre-8.4 versions of libraries only. Specify the compression level to use. Zero means no compression. For the custom archive format, this specifies compression of individual table-data segments, and the default is to compress at a moderate level. For plain text output, setting a nonzero compression level causes the entire output file to be compressed, as though it had been fed through gzip. The tar archive format currently does not support compression at all. Specifies verbose mode. This will cause PaGoDump to output detailed object comments and start/stop times to the dump file, and progress messages to Log tab. Dump only the data, not the schema (data definitions). This option is only meaningful for the plain-text format. For the archive formats, you can specify the option when you call pg_restore. Output commands to clean (drop) database objects prior to (the commands for) creating them. This option is only meaningful for the plain-text format. For the archive formats, you can specify the option when you call pg_restore. Use conditional commands (i.e. add an IF EXISTS clause) when cleaning database objects. This option is not valid unless Drop Objects is also specified. Begin the output with a command to create the database itself and reconnect to the created database. (With a script of this form, it doesn't matter which database you connect to before running the script.) This option is only meaningful for the plain-text format. For the archive formats, you can specify the option when you call pg_restore. Dump data as INSERT commands (rather than COPY). This will make restoration very slow; it is mainly useful for making dumps that can be loaded into non-PostgreSQL databases. Also, since this option generates a separate command for each row, an error in reloading a row causes only that row to be lost rather than the entire table contents. Note that the restore might fail altogether if you have rearranged column order. Dump data as INSERT commands with explicit column names (INSERT INTO <table>(<column>, ...) VALUES ...). This will make restoration very slow; it is mainly useful for making dumps that can be loaded into non-PostgreSQL databases. Also, since this option generates a separate command for each row, an error in reloading a row causes only that row to be lost rather than the entire table contents. Do not output commands to set ownership of objects to match the original database. 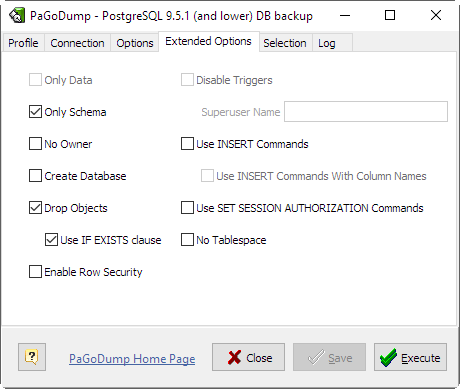 By default, PaGoDump issues ALTER OWNER or SET SESSION AUTHORIZATION statements to set ownership of created database objects. These statements will fail when the script is run unless it is started by a superuser (or the same user that owns all of the objects in the script). To make a script that can be restored by any user, but will give that user ownership of all the objects, check this option. This option is only meaningful for the plain-text format. For the archive formats, you can specify the option when you call pg_restore. This option is only relevant when creating a data-only dump. It instructs PaGoDump to include commands to temporarily disable triggers on the target tables while the data is reloaded. Use this if you have referential integrity checks or other triggers on the tables that you do not want to invoke during data reload. Presently, the commands emitted for this option must be done as superuser. So, you should also specify a superuser name with -S, or preferably be careful to start the resulting script as a superuser. This option is relevant only when dumping the contents of a table which has row security. By default, PaGoDump will set row_security to off, to ensure that all data is dumped from the table. If the user does not have sufficient privileges to bypass row security, then an error is thrown. This parameter instructs application to set row_security to on instead, allowing the user to dump the parts of the contents of the table that they have access to. On this tab you can specify what objects to be included or excluded from the dump result. If Object Kind is Schema and Action is Include this dumps only schemas matching Object Name. This selects both the schema itself, and all its contained objects. Multiple schemas can be selected by adding multiple rows. Also, the Object Name value is interpreted as a pattern according to the same rules used by psql's \d commands, so multiple schemas can also be selected by writing wildcard characters in the pattern. When using wildcards, be careful to quote the pattern if needed. When Include Schema is specified, PaGoDump makes no attempt to dump any other database objects that the selected schemas might depend upon. Therefore, there is no guarantee that the results of a specific-schema dump can be successfully restored by themselves into a clean database. Non-schema objects such as blobs are not dumped when Include Schema is specified. You can add blobs back to the dump with the Include BLOBs option. Exclude Schema causes do not dump any schemas matching the Object Name pattern. The pattern is interpreted according to the same rules as for Include Schema. When both Include Schema and Exclude Schema are given, the behavior is to dump just the schemas that match at least one Include Schema switch but no Exclude Schema switches. If Exclude Schema appears without Include Schema, then schemas matching Exclude Schema are excluded from what is otherwise a normal dump. Include Table dump only tables (or views or sequences) matching Object Name. Multiple tables can be selected by adding multiple Include Table rows. The Include Schema and Exclude Schema switches have no effect when Include Table is used, because tables selected by Include Table will be dumped regardless of those switches, and non-table objects will not be dumped. 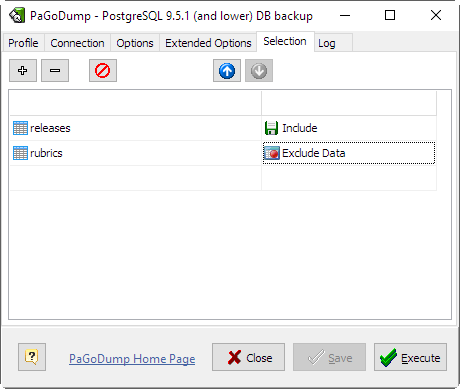 When Include Table is specified, PaGoDump makes no attempt to dump any other database objects that the selected table(s) might depend upon. Therefore, there is no guarantee that the results of a specific-table dump can be successfully restored by themselves into a clean database. The behavior of the Include Table is not entirely upward compatible with pre-8.2 PostgreSQL versions. Formerly, writing Include Table "tab" would dump all tables named "tab", but now it just dumps whichever one is visible in your default search path. To get the old behavior you can write *.tab. Also, you must write something like sch.tab to select a table in a particular schema. Exclude Table - do not dump any tables matching the Object Name pattern. The pattern is interpreted according to the same rules as for Include Table. When both Include Table and Exclude Table are given, the behavior is to dump just the tables that match at least one Include Table switch but no Exclude Table switches. If Exclude Table appears without Include Table, then tables matching Exclude Table are excluded from what is otherwise a normal dump. --help - will open this manual. --host - specifies the host name of the machine. --port - specifies the TCP port on which the server is listening for connections. --user - user name to connect as. --db - specifies the name of the database to be dumped. --pwd - specifies a password for the connection. --profile - specifies filename for the profile to be loaded at start. --execute - causes immediate dump operation start. --exit-on-success - causes program exit if no error is encountered while dumping the database. --profile parameter has the lowest priority. This means that any custom parameter specified specially, e.g. --host, --port etc. will be applied first. And not specified parameters will be taken from the profile. PaGoDump internally executes SELECT statements. 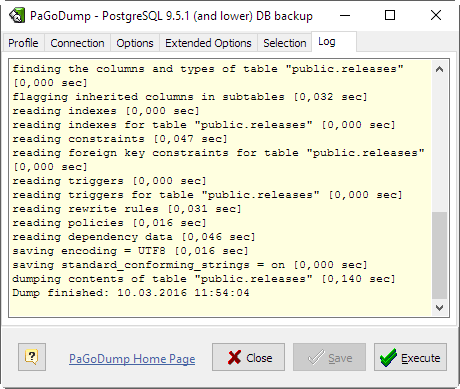 If you have problems running PaGoDump, make sure you are able to select information from the database using, for example, psql. PaGoDump has a limitation; when a data-only dump is chosen and the option "Disable Triggers" is used, PaGoDump emits commands to disable triggers on user tables before inserting the data and commands to re-enable them after the data has been inserted. If the restore is stopped in the middle, the system catalogs might be left in the wrong state. 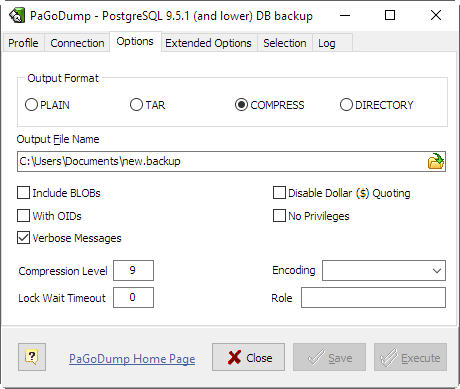 The dump file produced by PaGoDump does not contain the statistics used by the optimizer to make query planning decisions. Therefore, it is wise to run ANALYZE after restoring from a dump file to ensure good performance. The dump file also does not contain any ALTER DATABASE ... SET commands. 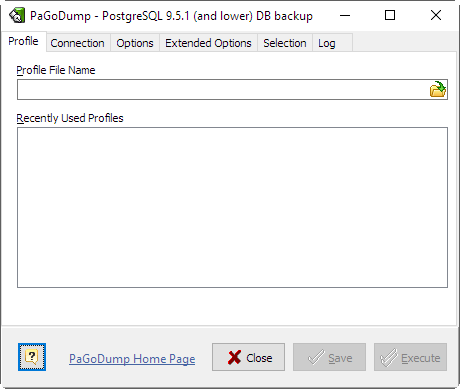 Because PaGoDump is used to transfer data to newer versions of PostgreSQL, the output of PaGoDump can be loaded into newer PostgreSQL databases. It also can read older PostgreSQL databases. However, it usually cannot read newer PostgreSQL databases or produce dump output that can be loaded into older database versions. To do this, manual editing of the dump file might be required. PostgreSQL v9.5.1 support introduced. Support for 9.4.5 and 9.3.7 versions added as well. Some bugs fixed. PostgreSQL v9.4.2 support introduced. Support for 9.3.7 and 9.2.11 versions added as well. Some bugs fixed. PostgreSQL v9.1.3 support introduced. Some bugs fixed.